Our country’s K-12 infrastructure is in crisis. Far too often, these learning environments are rundown and in disrepair, discourage and sicken children and teachers, waste energy, and fail to support a 21st century education. A new national study by the 21st Century School Fund, the National Council on School Facilities, and the Center for Green Schools sheds much-needed light on the grim reality: a $46 billion annual shortfall in funds needed to keep the country’s school buildings healthy, safe and conducive to learning. My research on California echoes the national trend: more than half of the state’s school districts underspend each year on their facilities, leading to all sorts of problems for students and teachers. The alarming fact is that millions of students across the country attend school in dilapidated, obsolete and/or unhealthy facilities that pose substantial obstacles to learning and overall wellbeing. In 2014, the National Center for Education Statistics found that more than half of U.S. public schools reported needing to spend money on their school buildings to bring them up to good condition. “Sick building syndrome” is a hard reality for many children, especially low-income and minority children who are more likely to have run-down school facilities. There is a clear relationship between the condition of school facilities and factors critical for student academic performance. We used this same standards-based approach when looking at California districts in our recent study of school facility spending in the state, Going it Alone: Can California’s K-12 School Districts Adequately and Equitably Fund Facilities?, at UC Berkeley’s Center for Cities + Schools. The authors of the new national report point to our California analysis to further illustrate their overall national finding that we’ve got a serious structural inequity in the nation’s school facility funding systems. “We are consistently and persistently underinvesting in our nation’s schools,” said Rachel Gutter of the Center for Green Schools at the U.S. Green Building Council. “Communities want to resolve these issues, but in many cases the funds simply aren’t there.” I concur. Let me zero in on what these findings mean for California. Comparing California nationally, the report finds that California is an “average under-spender.” But before we start patting ourselves on the back for being average, think about this: we scored only an average ranking of effort nationally during the time period when the State of California had relatively robust school construction and modernization funds available to school districts through the School Facility Program (SFP) (about $1 billion per year from 1998-2012). However, those state monies ran out by early 2013. Since then, California school districts are “going it alone” on maintaining, modernizing and building their facilities, without state support. 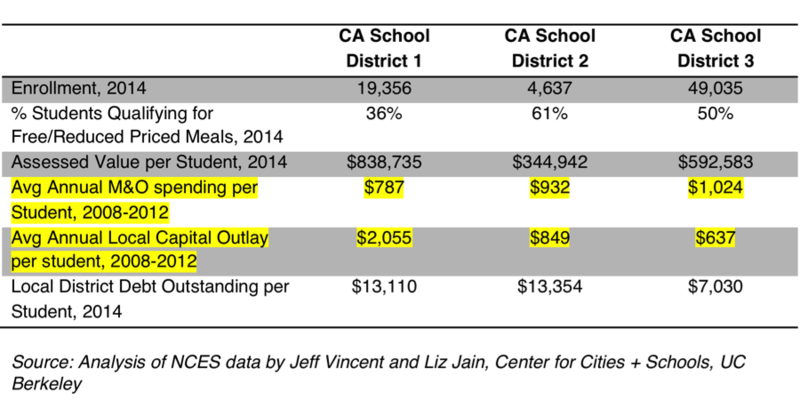 We found in our analysis that, compared to industry standards of minimum needed annual investments, 62% of California school districts underspend each year on facility M&O (maintenance and operations) and 57% of districts underspend on capital outlay each year. Almost 80% of California’s 6.2 million public school students attend districts failing to meet minimum industry standard benchmarks for facilities upkeep. Underspending on school facilities comes at great cost: student health and safety are risked, building functionality is reduced, and educational program delivery is compromised. While some California communities will likely step up their local investment in their school facilities to make up for the loss of state funds, its likely that many California communities can’t raise enough local money to adequately and equitably fund their facilities. The situation for every local district across the state is a bit different (heck, we have almost 1,000 of them! ), but let me highlight a few that illustrate the challenges faced across the state in ensuring adequate and equitable K-12 school facility funding. These examples show why providing healthy, safe, educationally appropriate and environmentally sustainable K-12 infrastructure is so complex and challenging. And as the Voice of San Diego news outlet rightfully pointed out, “Old buildings also get older with time, and they require maintenance to ensure they don’t fall into disrepair. Buildings are aging each day, so district officials are racing against the clock to make facilities better before they get worse. Inflation can also increase costs and negatively affect the [facility condition] index.” This example shows the reality: many school buildings are in drastic disrepair from years of underinvestment and that keeping them in good repair and functional requires yearly upkeep and upgrading. Also, I want to highlight our own analysis of facility spending patterns in recent years for 3 school districts in the Sacramento region. The yellow highlighted data are facility spending in the two main categories: Facility Maintenance and Operations (M&O) and Capital Outlay (major construction and renovation spending). Notice how different these districts are – in both spending patterns and basic characteristics of wealth. District #1 more per student on capital outlay, which eases its need to spend more on M&O out of the districts operating budget (that also pays teachers and buys educational materials). Compare that with Districts #2 and #3 – they have an opposite spending pattern. This reality highlights how the availability of facility funds directly relates to local district wealth – note that District #1 also has the highest local property values (assessed value). Lastly, consider this alarming fact that underscores an important result of this underinvestment: 1 in 4 California schools do not comply with recently passed state and federal laws that require free, fresh water to be served at schools wherever meals are served or eaten, according to a 2012 study. Getting back to the national picture…given the national underinvestment in K-12 school facilities, it’s no wonder that the American Society of Civil Engineers (ASCE) gives the U.S.’s K-12 infrastructure a “D” grade. Its also no wonder that the U.S. Department of Education’s Office of Civil Rights put out a 2014 “Dear Colleague” letter to state directors of education reminding them of their duty to ensure all students have healthy, safe and educationally suitable facilities. ED stressed that facility equity is essential to achieving resource comparability across schools. It’s also no wonder that there have been lawsuits over this fact in at least 16 states. But how did we let this drastic underspending happen? The short answer is that the U.S. has a locally controlled system for funding school facilities. This system of funding K-12 school facilities is determined by local wealth – thus, it has inequity built into it. This built-in inequity used to be the case for regular education funding – but nearly all states have remedied this, often due to court action. The federal government has also stepped in on education program funding – providing about 10% of all education program funding across the country. The Feds provide virtually no funding, however, for school construction or renovation (see here and here). States and the federal government stepped in to remedy vast inequities in K-12 education program funding. We need to do the same for K-12 infrastructure funding. This isn’t a problem we can continue to ignore. Underfunded school buildings will, over time, cause or accentuate health problems among children, undermine teacher performance and student achievement, and have a shortened useful building life. All of which are bad news for California and America. Via his article, Deputy Director Jeffrey Vincent eloquently sheds light on the disparity of what kind of educational setting is being provided between the children of the minority and majority. In fact, this is strikingly unfortunate: “’Sick building syndrome is a hard reality for many children, especially low-income and minority children who are more likely to have run-down school facilities.” But, of course, the disparity goes beyond the school environment. There is a disparity in public health care between the minorities and rest of our population. Like the education setting disparity, the public health disparity is a real and growing problem. Disparities of such are just growing. It is why I have dedicated my life towards the cause of advocating for the reform of public health care of African Americans. The deputy director is on the right track in bringing the education setting disparity to light. Remember: Health is Your Wealth! Curiously absent the article is the word “population”, “growth” or “immigration”. Just how can we pay to renew our school buildings if we must pay for the cost of educating the continually arriving new poor? Of providing housing for these millions? Of subsidizing their health care? This is a huge number who don’t begin to pay taxes to match the demands for service.